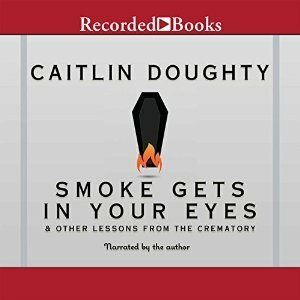 Most people want to avoid thinking about death, but Caitlin Doughty - a 20-something with a degree in medieval history and a flair for the macabre - took a job at a crematory, turning morbid curiosity into her life’s work. With an original voice that combines fearless curiosity and mordant wit, Caitlin tells an unusual coming-of-age story full of bizarre encounters, gallows humor, and vivid characters (both living and very dead). Describing how she swept ashes from the machines (and sometimes onto her clothes), and cared for bodies of all shapes and sizes, Caitlin becomes an intrepid explorer in the world of the deceased. Her eye-opening memoir shows how our fear of dying warps our culture and society, and she calls for better ways of dealing with death (and our dead). In the spirit of her popular Web series, "Ask a Mortician", Caitlin’s engaging narrative style makes this otherwise scary topic both approachable and profound. 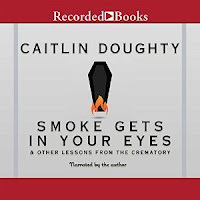 Caitlin Doughty, the host and creator of the "Ask a Mortician" Web series and the collective Order of the Good Death, is on a mission to change the way we think about death. I saw this book on a "best memoir" list and, when Audible featured it as a Daily Deal, I picked it up. In our family, it's customary to be embalmed for a viewing and burial. I'm not so sure that I want to be unnaturally preserved! I wanted to learn more about the cremation process, so that was my reason for choosing the book. Most people don't want to think about their own death, and this book provides a lot of food for thought. Caitlin takes a job as a crematory operator in San Francisco in her early 20s. She later returns to school to be a licensed mortician and has a desire to open her own funeral home with an alternative view to burial practices (which she does after the publication of this book). I enjoyed hearing about the rites and traditions of other cultures with respect to burial, including the washing of the dead by a family member. Caitlin describes, in detail, how a body is prepared for viewing (with and without embalming) and the cremation process. I found the book to be interesting, and there were even some humorous moments! Some parts of the book were difficult to listen to, especially the chapter on stillborns. I could have done without that one! Overall, I liked the book and admire the author's desire to help us achieve a "good death" for our loved ones and ourselves. This book was narrated by the author, and she did a fine job. I do enjoy when authors read their own memoirs, and it felt like I was sitting down with Doughty and listening to her tell me about her life. I made it much more of a personal experience. OK, wholly molly with all the challenges...WOW, just wow...I am currently doing two..you have like 100 here. Next - I never would think to listen to an audiobook about a memoir. This does sound interesting and the fact that the author reads it herself...LOVE. But, it is a hard subject for most people to think about death or even their death. Being a nurse I see it way to much. I think I would like to listen to this tho. Um, yeah, I have a bit of an addiction to challenges, LOL! I was intrigued with the book when I spotted it on a best memoir list. That's a genre that is out of my comfort zone, but it sounded interesting and stuck in my head. I hope you try it!